ON VACATION - April 10th to April 23rd. Orders placed during this time will be filled when I return April 23rd. All shipping timelines are effective from April 23rd and your order will be updated with a new estimated ship date after it is placed. Please allow a couple days after you order for the new date. I will still be answering questions during my vacation so feel free to contact me! 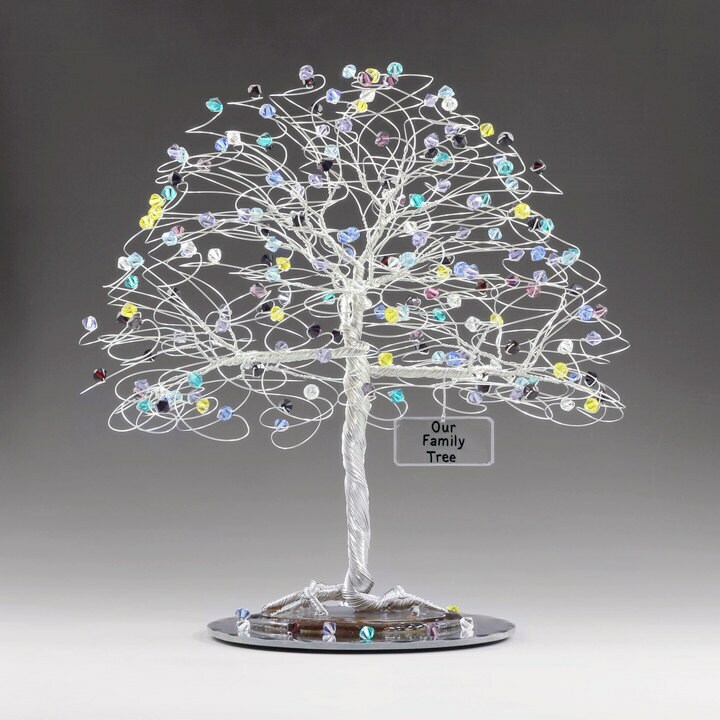 This personalized family tree sculpture is a great gift idea for mother's day, anniversaries, christmas, or other special occasion. The tree measures 8" wide and 9" tall with a 5" round mirror base. The sign is personalized with your choice of text. 1. Each month your family has a birthdate followed by the number of people in that month. Ex. 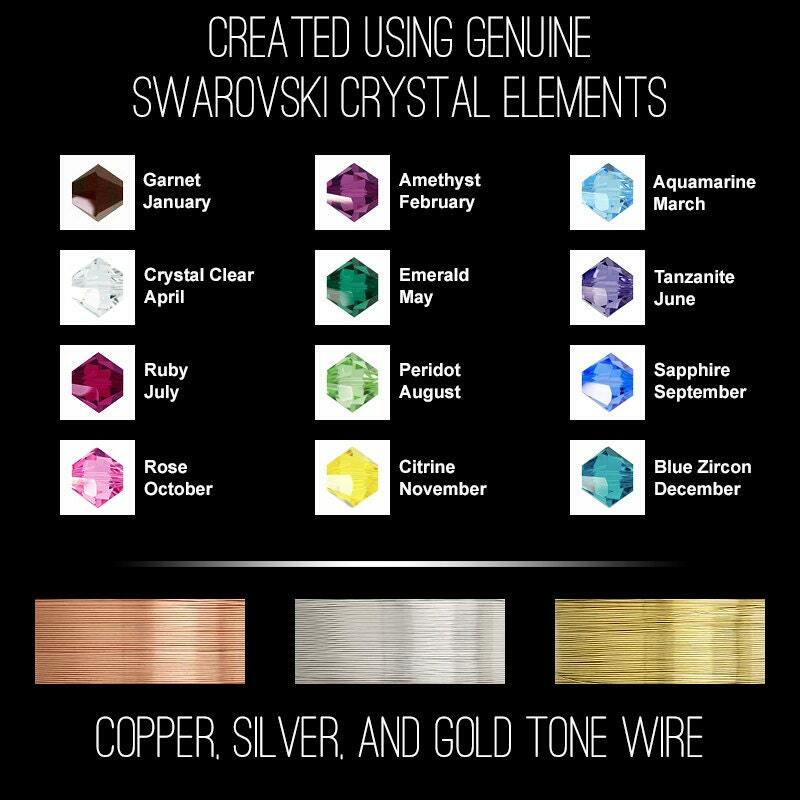 Apr 2, Jul 1, Aug 4 Your birthstones will be mixed evenly over the tree for each person. 2. Personalized text exactly as you would like it on the sign. Ex: "Our Family Tree" or "The Matthews Family"
You may say anything you like. The maximum amount of text is 3 lines with 17 characters per line including spaces. 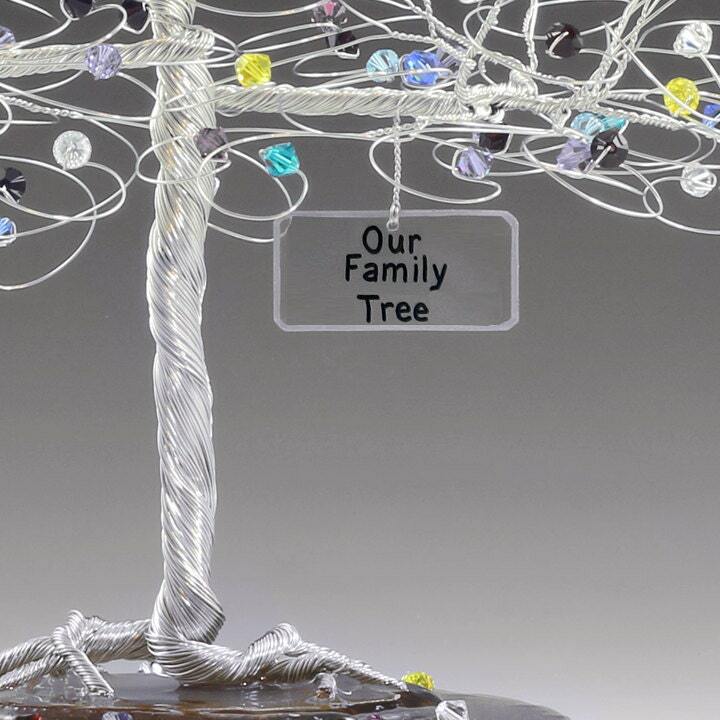 This family tree measures approx 8" x 9" and is created from your choice of silver, gold, or copper non-tarnish wire. 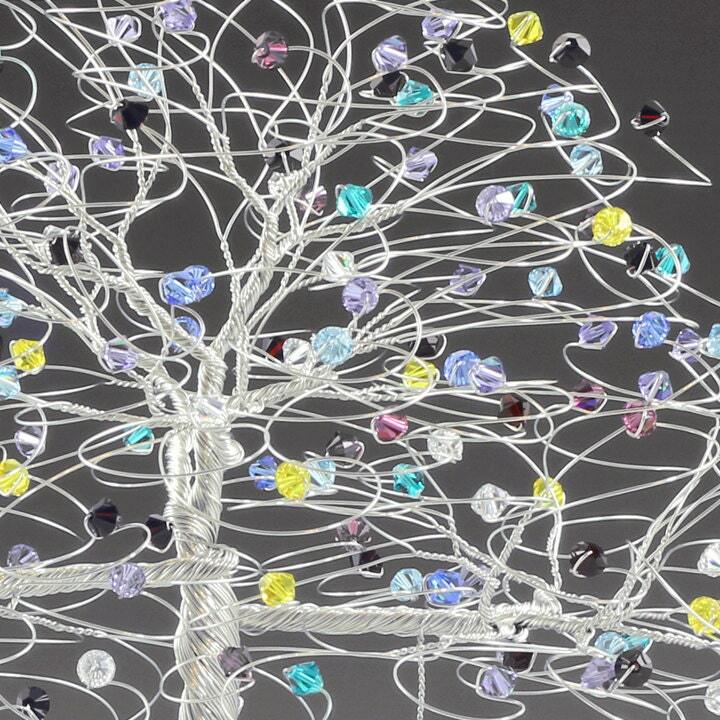 All of the branches end in genuine swarovski crystal elements and the base is a slice of natural brazilian agate attached to a 5" round mirror. The mirror is dotted with fallen leaf crystals matching your birthstones. The name sign is handmade out of clear acrylic. The name will be handwritten in black and the border will be silver, gold, or copper metallic to match your choice of wire. Print is on one side and can be seen through the back of the sign. Allow 1-2 weeks for the delivery of your tree in the USA. International orders arrive 2-6 weeks from the ship date. Rush orders are possible but please contact me before ordering. Ships via USPS Priority Mail within the USA and Internationally via First Class International Mail. Taxes will be automatically added for North Carolina residents. What if I am not happy with my purchase? If you are not satisfied with your purchase I will do everything possible to work with you. To return an item you must contact me via email within 3 days after your package is delivered to arrange a return. I can issue a refund for the item price upon delivery to me. Returns should be shipped with delivery confirmation or tracking number.t. Do not remove tree sculptures from the clear box it arrived in. I will not accept a return on an item that has been used for an event. In cases where special materials have been ordered for your tree I cannot accept a return. However if a custom tree is damaged in transit then I will repair or replace. What happens if my package is damaged? Every package I ship is insured and I always work to swiftly resolve cases where an order is damaged or missing. I take great care to package my work for safe delivery and cases of damage are rare. If an item is damaged upon arrival I ask that you contact me within 48 hours of delivery. If possible please include photos of the damage. Damaged items will be replaced as swiftly as possible. I do replace and ship the replacement item at my own cost. In some cases I may ask for a damaged item to be returned to me. I will also cover return postage when requesting a damaged item be returned. When a package is lost I am happy to work with you to find the package or send a replacement. I first check the tracking information for your package to see it's last location. If it is listed as delivered I ask that you check with other members of your household, neighbors, and mail carrier as well as look around outside your home to see if the package can be located. Customers living in apartment buildings can check with the main office to see if the package was left there. If the package still cannot be located I will submit a report to the post office to let them know the package is either lost in their system or has been stolen. If they are still unable to locate the package then I will replace the items. If you are an international customer then I ask that you wait a sufficient amount of time before I issue a replacement. Customs will often hold a package for a length of time before releasing it for delivery. Some international packages can take sometimes 2 or even 3 months to arrive. Sometimes you can check with your local post office in case the package is being held as customs due. International customers are responsible for all customs fees. If your order is incorrect. I do my best to make sure that every order is perfect before shipment but if i should make a mistake I will correct the problem at my own cost.